Durian McFlurry, Durian Pandan blended drink and Durian Jasmine Tea — for these past few months, there hasn’t been a single day when I haven’t taken a whiff of the King of Fruits’ pungent fragrance on the streets of Singapore. 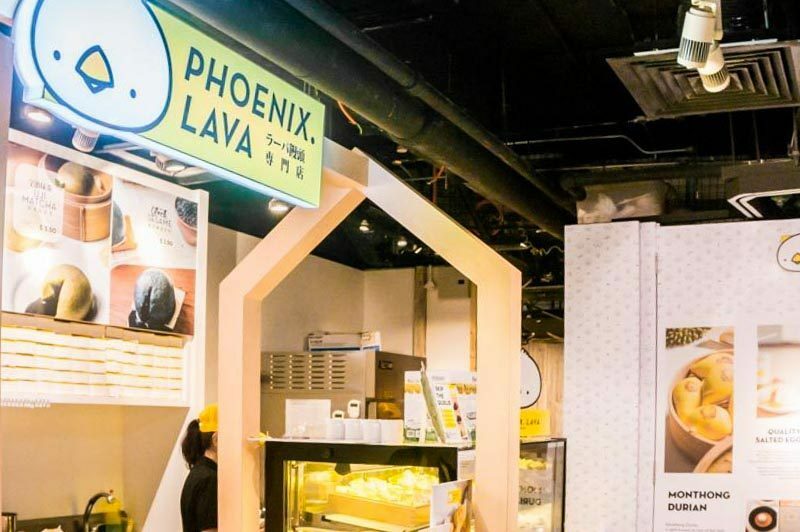 Well, it’s going to get even more exciting for durian-lovers with the arrival of Phoenix Lava at Raffles Xchange, a popular Bangkok bakery heating up the scene with durian lava steamed buns and other flavours with a tantalising ooze. Since 2013, Phoenix Lava has grown from a simple idea in a dormitory in Fukuoka, Japan: to reinvent steamed buns. After 100 trials, six months and 17 days of perfecting the ideal steamed bun, their mochi-like lava buns came to be, landing in different parts of Thailand, Vietnam, Malaysia, Macau, and finally now in Singapore. While it’s primarily a takeaway kiosk, the branch at Raffles Xchange also has three two-seater small tables if you’re looking to nom on the fresh buns straight away. Joining the Central Business District (CBD) crowd, the stall may be swamped by the time the clock hits lunch break, so keep the peak hours in mind. Currently, the stall carries five flavours of the steamed lava buns ranging from Durian to Salted Egg Yolk, Uji Matcha, Charcoal Black Sesame and Nama Chocolate. Made from 100% natural colours from flowers and plants, the buns have a mochi-like texture due to their special method of preparation. These lava buns are freshly-baked and efficiently packaged in cute phoenix logo printed bags. You can either request to have the buns steamed to munch on the spot or bring home your order to cook in two ways: steaming or microwaving. The highly recommended steaming method requires you to simply pop those buns in the steamer for six minutes when the water is boiling, but if you’re lazy you can prepare a bowl of water and balance a pair of chopsticks to rest the bun and place a microwave cover on top and wait for 30 seconds. I opted for the Assorted Box ($16) to get my hands on all of the five flavours for the full experience. Placed in a row in a slender rectangular box, the lava buns each had kyougi, a wooden sheet from Japan made from pinewood stuck on the bottom instead of regular paper. Before I could scarf down the lava buns, I decided to give the raved Durian Lava ($3.80) a try first. Designed to resemble durian seeds, the lava bun imprinted with a durian-shaped phoenix logo encased a filling made from Monthong durian which is ubiquitously sought after by the locals in Thailand. Before I could cut into it, a gentle fragrance of the sweet fruit filled my nostrils (don’t worry, you can still board the MRT and buses). After cutting into it, the durian lava spilt out with a creamy yet watery texture. The lava was sweet and surprisingly pungent, but some of you may prefer a more custard-like filling which might’ve elevated the durian experience. In terms of the bun itself, the texture was definitely not like your regular soft and fluffy baos. It had a chewier consistency due to the mochi-inspired method of making the batter for the buns. If you’re a die-hard fan of anything durian, you should get the Durian Box ($18). While the durian lava is the best-seller of the establishment, the Nama Chocolate ($3.50) and Charcoal Black Sesame ($3.50) looked just as good with their striking hot pink and black colours. The reddish-pink hue of the bun comes from beetroots, with a Nama (meaning fresh in Japanese) chocolate filling. Maybe because I’m sort of a perfectionist, I wished the face of the Phoenix was properly stamped onto the bun. Tearing into it, the bun overflowed with a warm chocolate lava which dribbled out effortlessly. I have to say, the chocolate filling wasn’t anything special — just sweet, warm milk chocolate lava to indulge your chocolate cravings for the day. It could’ve been richer with a dash of bitterness, but that’s just me. When the thick black sesame lava oozed out between the cracks of the charcoal bun, I was excited to have a taste of the “darkness”. The lava was slightly gritty from the pulverised black sesame and was, unfortunately, a tad too sweet which overpowered the natural mellow and roasted, nutty flavours. The Uji Matcha ($3.50) had a speckled layer of matcha dust with an overall pale-green appearance. The matcha is imported from the plantations at Uji in Japan, with the matcha lava being grainier and slightly thicker than the rest of the buns. It was mostly sweet but had a soft bitter aftertaste of the matcha. Last but not least, I was ready to try their Salted Egg Lava ($3.50) to compare it with the regular liu sha baos in Singapore. The salted egg lava of golden orange-yellow lazily dripped onto the plate as I tore the bun in half. Compared to liu sha baos, the lava bun was mainly sweet with subtle salty notes and was smooth rather than grainy. Like all of their other buns, the lava consistency was more towards a liquid form so I’d be careful not to let any of the fillings go to waste — unless you’re going to sacrifice it for a Boomerang. Phoenix Lava is worth trying at least once for those oozing lava dessert fans out there, but the buns’ thick and chewy exterior and liquid core might not be to everyone’s liking. If you’re nearby and looking for a quick and simple snack, you can give these lava buns a shot!